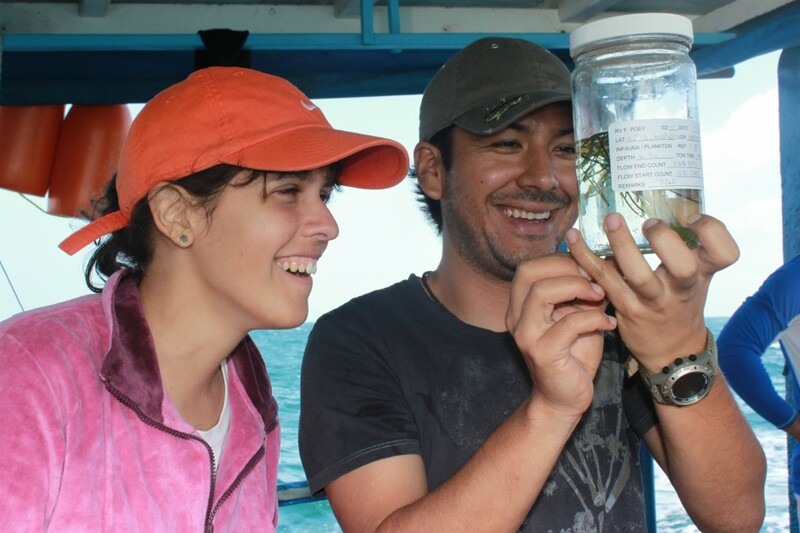 Cuban and Mexican researchers, Alejandra Briones and Ivan Mendez, look at a sample that will be analyzed in CIM’s lab to assess the faunal communities in the water column. Part III of a blog series detailing a February 2013 Research Expedition in Cuba organized by EDF Oceans’ Cuba, Science, and Shark teams and funded by the Waitt Foundation. A team of scientists from Cuba, Mexico and the U.S. along with EDF staff set sail to share knowledge, scientific methodologies and to survey shark populations in Cuba. The tri-national expedition was led by Cuban scientists from University of Havana’s Center for Marine Research (CIM) and U.S. scientists from the Mote Marine Laboratory in Florida. The tuna fishing crew meets up with the research team in the Gulf of Batabanó. 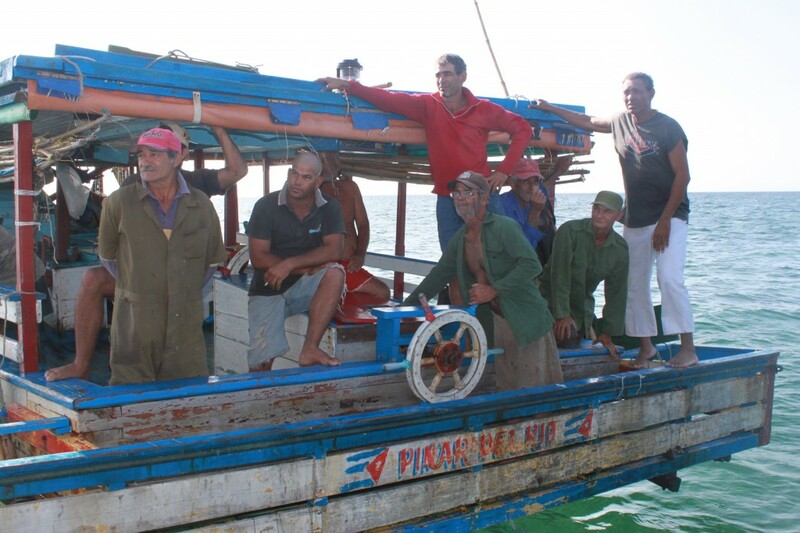 Part II of a blog series reporting on the February 2013 Research Expedition in Cuba organized by EDF Oceans’ Cuba, Science, and Shark teams and funded by the Waitt Foundation. 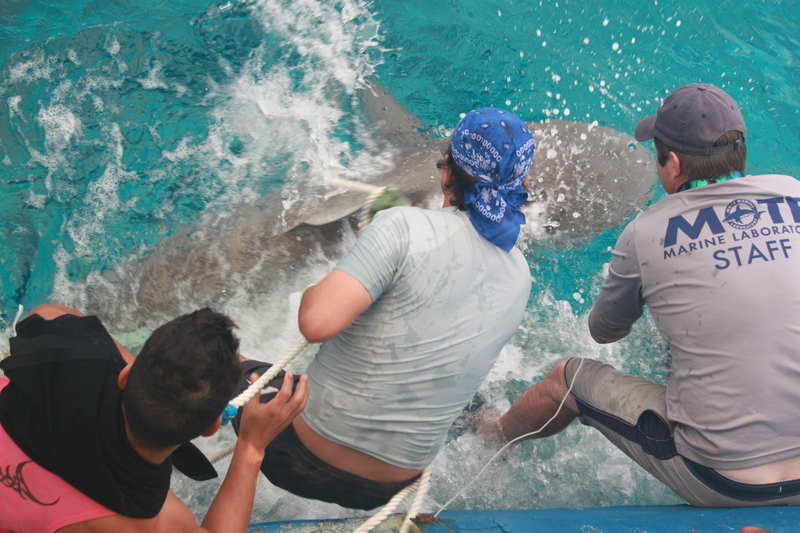 A team of scientists from Cuba, Mexico and the U.S. along with EDF staff set sail on an exploratory research cruise to share knowledge, scientific methodologies and to survey shark populations in Cuba. The tri-national expedition was led by Cuban scientists from University of Havana’s Center for Marine Research (CIM) and U.S. scientists from the Mote Marine Laboratory in Florida. Intro by Dan Whittle: With generous support from the Waitt Foundation, Environmental Defense Fund (EDF) has launched a new initiative to support collaborative field research with scientists from the University of Havana’s Center for Marine Research. This initiative is enabling teams of Cuban, U.S. and Mexican scientists to carry out a series of scientific expeditions to conduct important new research on Cuba’s remarkable—but understudied—marine and coastal ecosystems. This effort will also support year-round port sampling of shark fishery landings at Cuban ports, contributing to EDF’s overarching tri-national shark conservation efforts throughout the Gulf of Mexico. On our inaugural expedition in February 2013, our tri-national team embarked on a research cruise off of Cuba’s south coast in the Gulf of Batabanó to share knowledge and scientific methods, and to survey migratory shark populations. The expedition was organized by EDF Oceans’ Cuba, Science, and Shark conservation programs and led on-the-water by scientists from University of Havana’s Center for Marine Research (CIM) and from the Mote Marine Laboratory in Florida; with participation by a scientist from Mexico’s College of the Southern Frontier (ECOSUR).